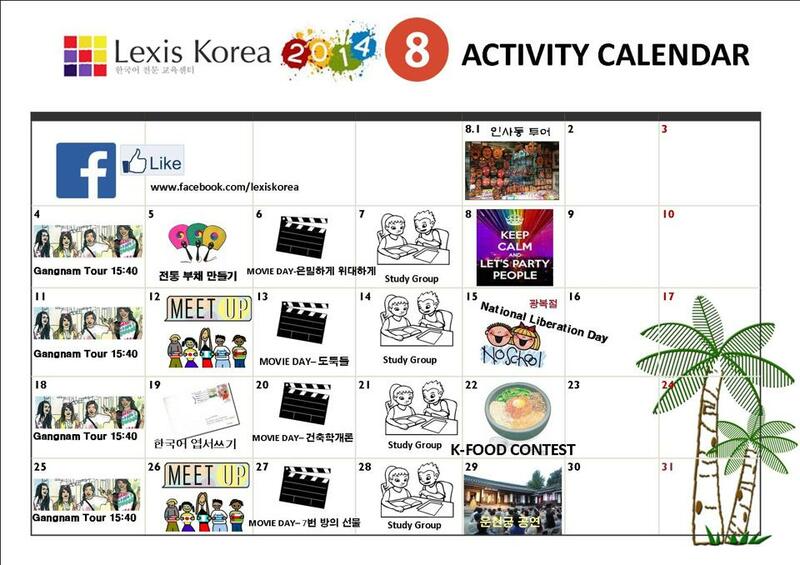 August Activity Calender has come out! Here is our activity calender for August! Every Monday, we have our Gangnam tour for new students. We have Korean movie day each Wednesday! On Thursdays, there are study groups and don’t forget every two weeks we host the Lexis Meetup. Every other Tuesday there are special activities such as traditional Korean fan making or Korean postcard making. On Fridays, we like to get out and about in the afternoon, so we have outdoor activities lined up….. except on the 15th when it is the National Liberation Day. So no school on that day as it is a public holiday! On the 8th, we have our famous Student Night to look forward to…you can sleep in and recover on the 9th. We have a tour to Insadong(인사동) and a performance at Unhyeon Palace on the other Fridays. Finally, prepare yourselves for a K-Food contest on the 22nd of August, when students can show off their Korean cooking skills! So don’t miss out on any activities since it will be a LOT of fun!